They will now sell 150,000 tickets across two weekends for 2012 – which are still expected to sell out. The festival will take place on the weekend of April 13-15 and April 20-22 next year. Weekend passes for next year’s event are set to go on sale almost immediately this Friday at 10am PST until Friday, June 10th at 10pm PST. 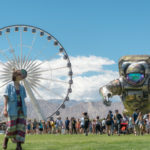 The three-day passes will cost $269 (with some additional fees), but can also be bought on the 8-installment layaway plan. Buy your tickets soon! Next year is just around the corner.